These cases happen when children are left unattended in a hot car, sometimes because the driver forgot the child was there or when children get into unlocked cars without any adult knowing it happened. Within minutes, they can be in danger. "It is never OK to leave children in a car even with the windows down,” says Christopher McStay, MD, an emergency room doctor and assistant professor of emergency medicine at New York University Langone Medical Center. “It is an absolute no-no." McStay has seen his share of hot car casualties in the emergency room. “Your car is a greenhouse and temperatures can get exceedingly hot in an exceedingly short period of time," he says. “There is no safe amount of time to leave children alone in the car,” says Nathan Allen, MD, an emergency medicine doctor at the University of Chicago. “Kids are more susceptible and at higher risk for heat-related illness and injury than adults because their bodies make more heat relative to their size and their abilities to cool through sweating are not as developed as adults.” As a result, just a few minutes can be extremely dangerous -- even fatal for a small child. “On a day that is just 22 degrees Celsius, the temperature [inside a car] can increase by 30 to 40 degrees in an hour, and 70% of this increase occurs the first 30 minutes,” he says. Heat stroke may occur when body temperature passes 40 degrees Celsius. That overwhelms the brain's temperature control, causing symptoms such as dizziness, disorientation, agitation, confusion, sluggishness, seizure, loss of consciousness, and/or death. 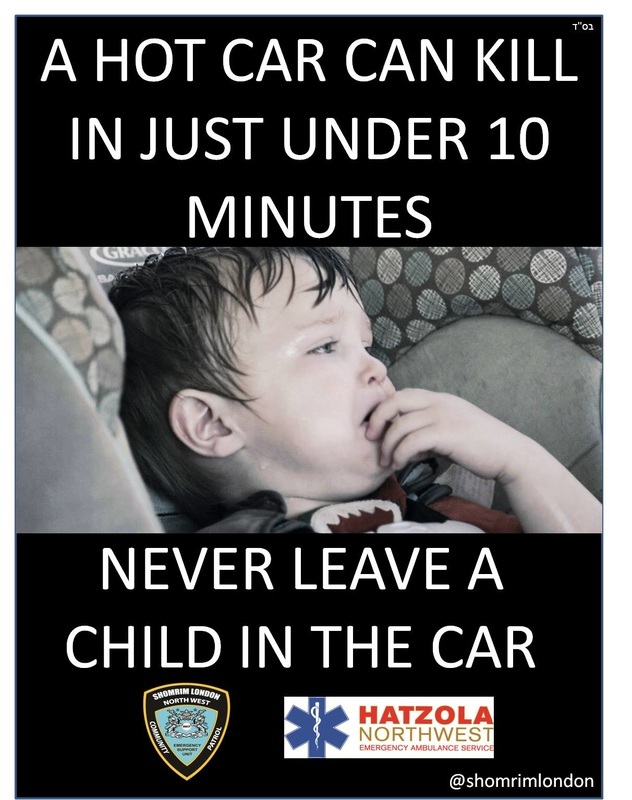 If you see a child alone in a hot vehicle, call the emergency services immediately, If they are in distress due to heat, get them out as quickly as possible. Unfortunately, some child carriers have hoods, so you can’t tell if there is a child in the seat. We wish you and your families a safe Summer! Have a look at the online version of the Shomrim NW London Safety Guide which provides information and crime prevention advice and safety tips.